Assessment: What Kind of Community Is Your Page? Although deciding to use the new control may seem straightforward, it sends a powerful message that can significantly weaken or strengthen the community you have built around your Page, so I encourage you to consider it carefully. Your team can ask themselves these questions to arrive at a satisfactory answer. Review the content strategy and goals for your Page as well as the social business strategy on which they are based. What outcomes and business benefits do they specify? Review the priority of stakeholders whom you are trying to engage on your Page; have you been successful in engaging your highest priority stakeholders? You should have 3-5 distinct stakeholders identified. For each stakeholder, analyze their movement along Facebook’s hierarchy of social actions. Using Facebook Insights, review posts that seem to make higher order interactions increase or decrease. Does your strategy call for using your Page as a brand presence in which you share content with Likes, or do you want “the community” to be more active and have more “ownership” of the space? Go back in your timeline: how serious of a problem are offputting posts by Likes? Remember, when Likes post things that you don’t believe belong, that gives you the chance to show the community what doesn’t belong and why (example, right); if you model the behavior and you resonate with your top priority stakeholders, they will help you protect the community. Remember, Insights makes it easy to see what posts cause more Like or Leave Page social actions, and all Likes are not created equal; focus on highest priority stakeholders/Likes. If your team’s answers to the diagnostic questions indicate little engagement and a significant degree of spam, consider using the control, but realize that a significant portion of Likes may be miffed; once they see that they cannot share on your Page spontaneously, they may leave; their engagement will certainly diminish. Along with this, explain publicly why you implemented the control, talk up your policy and plan to deactivate the control when defined conditions are met. State this publicly. The strongest communities have a palpable ethos of collective ownership, but few Facebook Pages have succeeded in building strong communities around their Pages. Using the control would likely dampen the sense of community you may have, so unless you have a big problem, don’t use it. Remember, the Page should primarily serve your Likes in most cases, not your company (serving them serves you, but they must have the priority for it to work). So it’s not about whether you are uncomfortable or inconvenienced, it’s about them. By using the control, you are taking away their voices; you are saying that you don’t trust (some of) them. Unless you have a major problem, a few renegade posts, especially when you comment on them, explaining why they are inappropriate, are good for your Page. They are opportunities for you to model behavior you want your Likes to adopt while showing people what goes and doesn’t. How you deal with conflict is a very effective trust accelerator. People pay close attention to conflict. To deal with conflict effectively, you need to be grounded in truth and congruent in how your desire to serve key stakeholders will enhance your business. This has to resonate within the company and its social venues. People will feel your congruence or lack thereof. First, from the above discussion, it should be clear that CSRA’s client work has consistently shown that Pages deliver more value when they build a sense of community because stakeholders feel more ownership and interact more and at a deeper level. By removing spontaneity, Facebook is offering Page owners the opportunity to make their presences more antiseptic, and many owners will probably implement the control and unknowingly sabotage their chances at creating engagement and value. 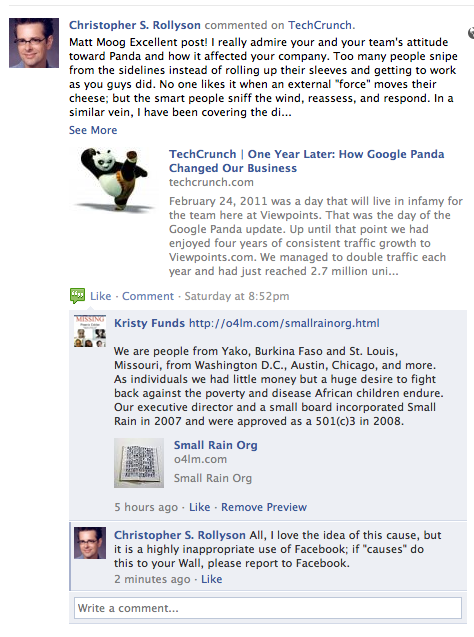 Second, Facebook’s Timeline is terrific for people or brands that want to be highly public with their information. As head of marketing myself several times in my career, I can appreciate that Facebook is encouraging users of (personal) Profiles to organize their information to optimize for advert opportunities. It’s well known that people are more open to changing their “suppliers” of products and services around life-changing events (i.e. Timeline). Here’s a revealing post on Target’s data mining in which it predicts mothers’ degree of pregnancy based on their retail purchases, and surreptitiously propositions them. Imagine Facebook Timeline in this context. It’s brilliant but chilling. With these developments in mind, watch Facebook carefully. If they weaken the platform significantly, you can hedge your investment and migrate your stakeholders to another venue: relationship survives platform if you are grounded in building it. Any good social business strategy will anticipate the possibility of migrating communities to other platforms, almost like a DR plan (disaster recovery). The post Behind the Scenes with Facebook Pages’ New Pre-Moderation Control appeared first on Christopher S. Rollyson and Associates.